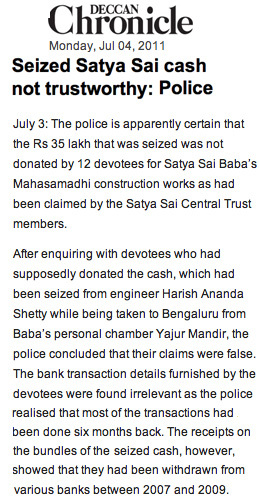 The Sathya Sai Central Trust official claims that the seized Rs 35.5 lakhs was from 12 devotees, meant for Sai Baba’s memorial (samadhi) construction, and that it was not the Trust’s money. This has been nailed as a lie by the police. Twelve devotees of Sathya Sai Baba had furnished documents that they had donated the cash, and had even claimed that the cash should be returned to them, so the police started questioning them a few days back. It now seems they had furnished false statements to the police at the behest of Sathya Sai trust members. The receipt stamps on the seized cash show that the cash was drawn from banks between 2007 and 2009.and the 12 Sathya Sai devotees, when asked to give bank statements to show that the cash had been drawn by them, furnished bank statements from 6 months previously! 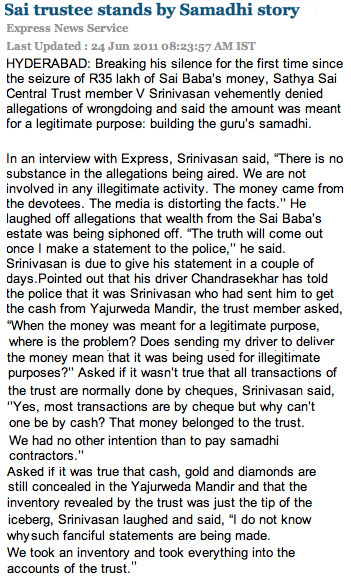 Now that investigators have got solid proof that the 12 “devotees” had been setup by the Trust members, the 2 trust members Srinivasan and Ratnakar are most likely to be charge sheeted and cases filed for cash embezzlement , forgery and maybe other offences like providing misleading statements to investigators and govt officials deliberately ( with criminal intent). It is most surprising how “Sathya Sai devotees” agreed to deliberate cheating! Had not their “Swami” instructed them to always speak the truth? Perhaps the fact of gold and cash being stashed in the master’s room made the followers emulate their guru, who always plagiarised Mahatma Gandhi saying “My Life is My Message”? “The money belongs to the Trust”….in an interview to Indian Express two days before being questioned by the police about the seized 35.5 lakhs. In the same interview, Srinivasan dismisses outright the suggestions that there could be more gold, silver valuables in Yajur mandir. (June 24th)….From the earlier “all transactions by check only with receipts issues”, it is now ” most transactions are by check…and some cash transactions”! See scan on left from Express News Service. Note the following points from the press release…..about how the Trust accepts NO CASH DONATIONS. Donors deposit the cash directly in the bank branch opened in the premises of the Trust. No employee of the Trust can receive any cash donations from the donors. Donors who like to donate outside the banking hours are advised to donate through debit card machines of the bank. As such there are no cash collections with the Trust which are not accounted for. Cheques/drafts received by the Trust are deposited daily in the bank by the Finance Officer of the Trust. Any foreign contributions received are credited in a separate bank account as per approval given by the Home Ministry under the Foreign Contribution Regulation Act, 1976. The receipts duly signed by the Secretary of the Trust are sent to the donors at the addresses given by them. All works and projects of the Trust are approved by the Founder Trustee, Bhagawan Sri Sathya Sai Baba who only has the power to sign cheques for disbursing payments for the approved works/projects. All payments to various suppliers/contractors are made by A/c payee demand drafts or by transfer through RTGS directly for credit to the bank accounts of various suppliers/contractors. No payments are made to any party by cash. When such is the official and legal status of the registered Sathya Sai trust, the following questions are MOST obvious. 1. How did Sathya Sai Baba, presumably aware of all the rules/laws of his own trust of which he was the check signing authority, accept huge cash and gold donations and not even declare them to his own trust ? 2. If those “donations” of cash, gold, diamonds and silver, could not be valid and legal donations to the Trust, why did Sai Baba accept it ? 3. Is it not a straightforward fact that Sai Baba had knowingly committed and attempted to hide a criminal act ? 5. Is it not patently obvious that the Sathya Sai trust , now…..and Sathya Sai Baba earlier, have been accepting illegal contributions to the trust, hoarding it and also hiding it…and even worse, upon discovery, trying to pay “advance tax” on it and claiming the hoarded wealth as their own ? Shouldn’t these questions be raised by the public and media to the officials, government and Income tax authorities, and shouldn’t serious criminal cases be filed against Sathya Sai Baba ( deceased offender) and also the Sathya Sai trust for criminal financial fraud ? This entry was posted on July 4, 2011 at 9:17 am	and is filed under Cults, Gurus, Sathya Sai Baba. Tagged: Prashanthi Nilayam, Sai Trust. You can follow any responses to this entry through the RSS 2.0 feed. You can skip to the end and leave a response. Pinging is currently not allowed.